The history of Bradley airfield begins in 1941. With war underway in Europe and the federal government looking to locate a military air base in Connecticut, the state purchased 1,700 acres of tobacco farmland in Windsor Locks and leased the site to the federal government. Soon an army air base was constructed on the site, named in honor of Second Lieutenant Eugene M. Bradley, a 24-year-old newly-wed pilot who died in a routine training exercise held on the base in August 1941. 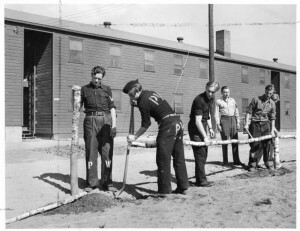 During the war years, Bradley Field served as a training base for air combat units, a staging area for overseas deployment and, toward the end of the war, as a camp for German prisoners of war. The field was deactivated in 1945 and returned to state ownership soon after. In 1947, Bradley Field became the home of the Connecticut Air National Guard, which for many years had operated out of Brainard Field in Hartford. Because of its position midway between New York and Boston—and lack of coastal fog— Bradley Field presented an attractive site for the development of a commercial airport, and plans for its conversion began in the late forties. Raising funds through a $2,000,000 bond issue, the state constructed a modest terminal building that contained the control tower and all the passenger and administrative facilities needed to operate the small airport. The terminal opened in 1952, with regional air service provided by Eastern, United, Northeast, and American airlines. The airport also attracted several important aviation industries to the site, most notably the Kaman Corporation, which manufactured helicopters. On December 11, 1951, Kaman successfully operated the world’s first turbine-powered helicopter at Bradley Airport. 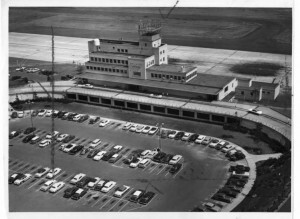 As airport volume increased to one-half million passengers and 10 million tons of cargo per year by the end of the 1950s, the first of several expansions was completed. To celebrate the coming of the jet age, staff strung a ceremonial ribbon across the runway and a jet fighter plane flying just above ground level cut it in two. Jet airliner service began at Bradley Airport in February of 1961, when United Airlines flew from Bradley to Los Angeles and San Francisco with a stop in Cleveland. Four turbojet engines, manufactured by Connecticut’s Pratt & Whitney Aircraft Company, powered the airplane, a Boeing 720. Over the decades, increases in passenger and freight traffic have driven continued expansion of Bradley’s facilities. In 1965, the airport added two passenger wings to the original terminal and lengthened runways to accommodate larger jet airplanes. In 1983, terminal facilities, parking and hotel accommodations were increased, and airport operations were further modernized in 2007. Airport expansion has also led to noise issues in surrounding communities. These have been mitigated through revised zoning regulations and noise abatement programs. 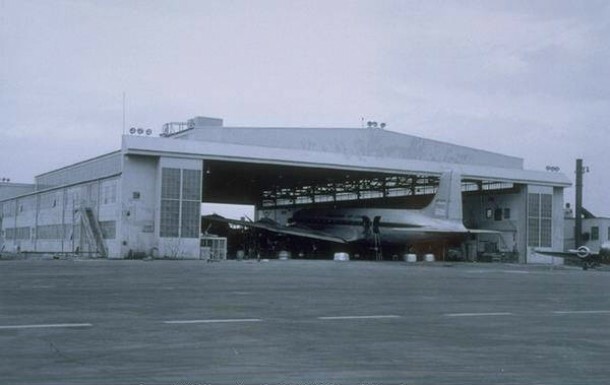 In 1966, Bradley was designated an international airport, though service to overseas destinations was sporadic and limited. Also, many overseas flights were not direct; they required a stop over at Logan Airport in Boston. Today, some eight major airlines provide nonstop service out of Bradley to more than 30 US cities as well as flights to Canada and Puerto Rico. Bradley International Airport is managed by the Connecticut Airport Authority, a public agency created in 2011 to oversee the operation of all state-owned airports. Airport operations are funded solely with revenue generated by airport use and allocations from federal programs. With more than five million passengers per year passing through Bradley International Airport, the goal of the Authority is to use the state’s largest air transportation facility as a means to further economic activity in Connecticut. “Bradley Field World War II Activities, 1942-1945 - Digital Archive.” Connecticut State Library, 2017. Link.